Former DePauw School of Music Dean Ayden Adler said she was “stunned” to learn of staff member allegations that led to her dismissal. In her first public statement since her departure on March 13, Adler did not recount the allegations, but said she had not been given any opportunity to address the staff members’ concerns. While four staff members including Caroline Jetton, associate dean of the School of Music and director of education, Toni Robinson, director of admission, Steven Linville, director of operations and Jennifer Soster, aide to the dean, left their offices on March 13, they have all returned to their offices after Adler’s departure. “I have received no substantive response regarding the allegations, nor an opportunity to address them. Despite this, Dr. [Mark] McCoy decided to relieve me of my duties as Dean of the School of Music,” Adler said in a statement. Adler declined a request from The DePauw for a sit-down interview. Her statement reflects similar confusion expressed by many students and faculty inside and outside the School of Music. Adler said she planned to stay on as a tenured faculty member. President Mark McCoy’s decision to dismiss Adler comes two months after Anthony Jones, vice president for enrollment management, departed in a similarly abrupt fashion in January. Both Adler and Jones were hand-picked by McCoy. Ken Owen, executive director of communications for the university, on Tuesday night said issues that led to Adler’s removal dated back to last year. “After much deliberation and consultation with a variety of affected parties, including Dr. Adler, President McCoy determined that the School of Music would be better served under new leadership,” Owen said. Adler’s statement hinted of ongoing legal negotiations with the university, but she was not specific. “My counsel and I are currently working with the university and its counsel to understand the circumstances surrounding this sudden and unexpected action,” she wrote. 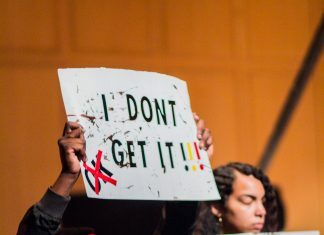 Adler’s departure as dean, a position in which she succeeded McCoy after he was named president in 2016, has sparked a mixed response on campus. Some students expressed concern while others have felt that normalcy has returned to the School of Music. Rich Cameron, professor of philosophy, sent a six-page email on March 21 to McCoy and faculty questioning McCoy’s unwillingness to explain his decision and emphasized shared governance and its role in facilitating difficult faculty decisions. Cameron asked faculty to reconsider the structure of decision making that is referred to as “shared governance” a common practice among universities. In an email to faculty, Cameron emphasized the importance of DePauw’s adherence to traditional norms of “shared governance” established by the American Association of University Professors (AAUP), a nonprofit membership association of faculty and other academic professionals. While four administrators left their offices on Monday, March 13 before the release of Dean Adler, a formal contribution from faculty did not occur and conflicted with AAUP protocol. Cameron was harsh in his critique of McCoy’s email update. “Thinking about this barren wasteland of an email – a rhetorical effort so dead and wry that even acknowledging Dean Adler’s name apparently would have added too much greenery, too much light and life, to survive into the final draft – might help illuminate the ins and outs and ups and downs of the so-called ‘shared’ governance of Universities like DePauw,” Cameron said. Former senior vice president and dean of the New World Symphony in Miami Beach, FL, Adler came to the DePauw School of Music in 2016 with several years of music leadership experience as well as degrees from Princeton University (A.B. ), the Juilliard School (M.M. ), and the Eastman School of Music (M.A., D.M.A., Ph.D.). Adler was announced Dean of the School of Music on March 7, 2016. McCoy praised her appointment. “Dr. Adler is a creative, forward thinking musician and educator who epitomizes what it takes to adapt and succeed in a changing musical universe. She will lead this grand school to new heights,” McCoy said. But he withdrew his support last week, and he has not explained why. In an interview with The DePauw on Tuesday, he paused for about ten seconds when asked if Adler was the wrong choice. “I want to try to protect everyone in this process. I thank Dean Adler for her good work in that role,” he said. Tabatha Hickey, junior clarinet player and student assistant to the Dean of the School of Music, supported McCoy’s handling of the situation. Although Hickey’s position was meant to work together with Adler, Hickey found herself mostly working with Suzanne Hassler, manager for music marketing and publications. Kevin Killeen, senior trombone player did not know the extent to which administration and Adler were divided. “I did not realize there was that much conflict between her and the administration and I just hope she’s doing okay,” Killeen said. Deb Hurst, an employee at Café Allegro, could feel the difference and the anxiety in the School of Music the week following Adler’s departure. Classes continue at the School of Music and Anne Harris, vice president of academic affairs, and Caroline Jetton, associate dean of the School of Music and plan on facilitating the logistical concerns and McCoy takes on the roles of scholarshipping for the class of 2021.